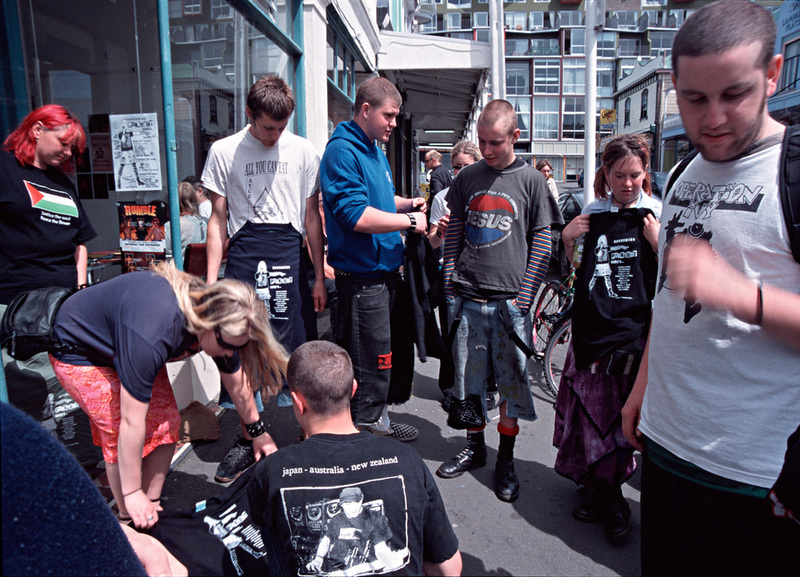 Up The Punks started in 1999 as a personal project to document the Wellington punk scene. I'd been to gigs at Thistle Hall (the unofficial home of Wellington punk) years before and returning to that scene to photograph in the late 90s brought into stark relief how little I or many others there knew about all the previous generations of Wellington teens who had climbed the narrow stairs to pogo, mosh and slam to bands from the suburban wastelands of Johnsonville, Stokes Valley and Lower Hutt. 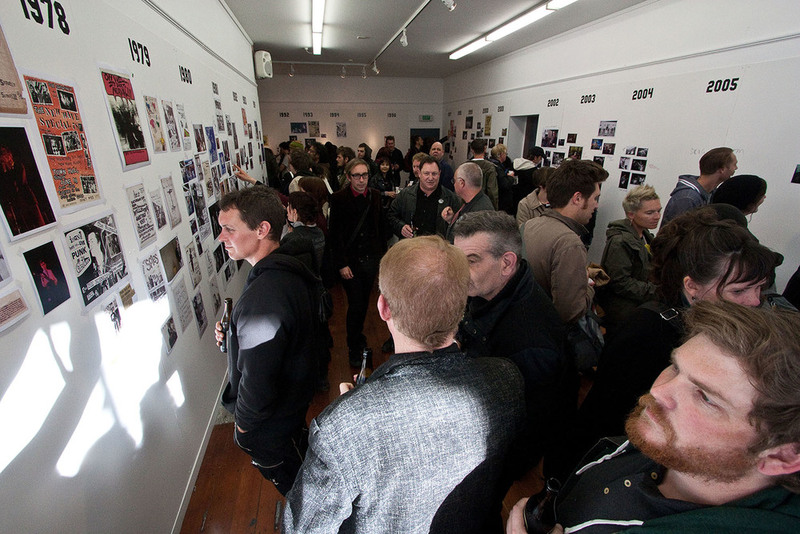 What began as a series of gig photos soon morphed into an expanding archive of material charting the contemporary and historical presence of a punk scene within Wellington. 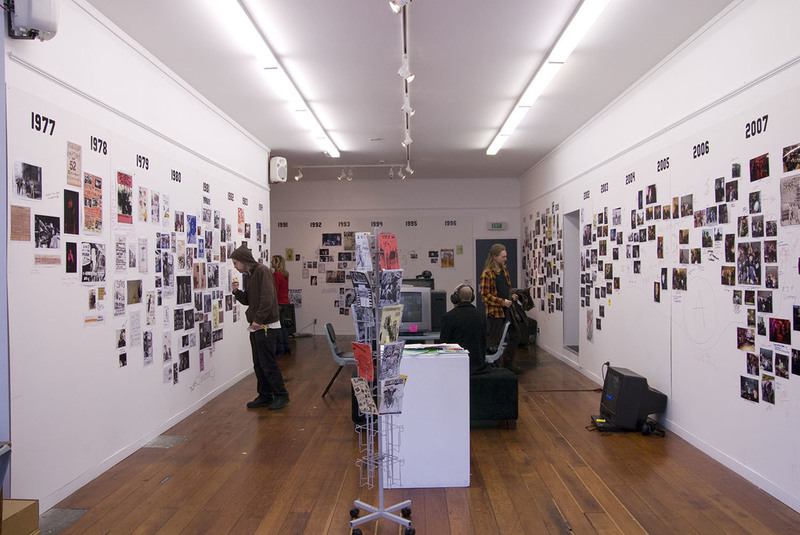 In 2002 the first UP THE PUNKS exhibition was held at Thistle Hall gallery. Collaborating with visual artist and designer Kerry Ann Lee UP THE PUNKS 2002 sketched out a loose history of the Wellington scene over 25 years. With no authoritive texts to refer to local histories had to be uncovered from the photo albums, private collections and stories of those who had been there. Since February 2011 much of the gathered archive material has been making its way on line through the launch of an Up The Punks wiki site. In 2012 UP THE PUNKS returned to Thistle Hall bigger and better with social media, the internet and a growing in interest in local histories making the task of digging up arcane facts about obscure bands a lot easier. Riffing off the two-way street of social media platforms UP THE PUNKS 2012 allowed the audience to write directly on to the walls setting up an active dialogue over the course of the show. As well as the exhibition UP THE PUNKS 2012 also hosted two nights of music with GETTIN WORSE: PUNX STILL ANGRY featuring 4 bands heavily involved in the current Wellington scene, and NO WAVE SPACKTACKULAR held up stairs at Thistle Hall to close out the show. Old school punk Skippy viewing videos from the Wellington punk scene over 35 years. Exhibition as a collaborative story telling tool. Poster for the original UP THE PUNKS exhibition in 2002. Drying freshly screen printed t-shirts during the UP THE PUNKS 2002 exhibition. Tui decorating his jacket on the floor of UP THE PUNKS 2002.